I have been a member of the school of podcast since day one of my podcasting career so you can blame Dave for my addiction to the medium. 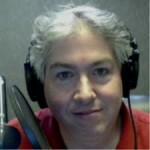 In November of 2005 Dave Jackson launched the School of Podcasting and he has been going strong ever since. This has lead to other podcasting related sites and services including Podcast Mechanic (consulting), Podcast Clicks (promotion), Learn to Subscribe (free tutorial for listeners), Podcasting Shirts (clothing), Planning Your Podcast (free tutorials). and Cooler Websites (design and blog hosting). He was recently selected to be the Director of Podcasting at New Media Exposition.